SCOPE organizers & staff from Physicians for Social Responsibility in Sacramento visiting elected officials. 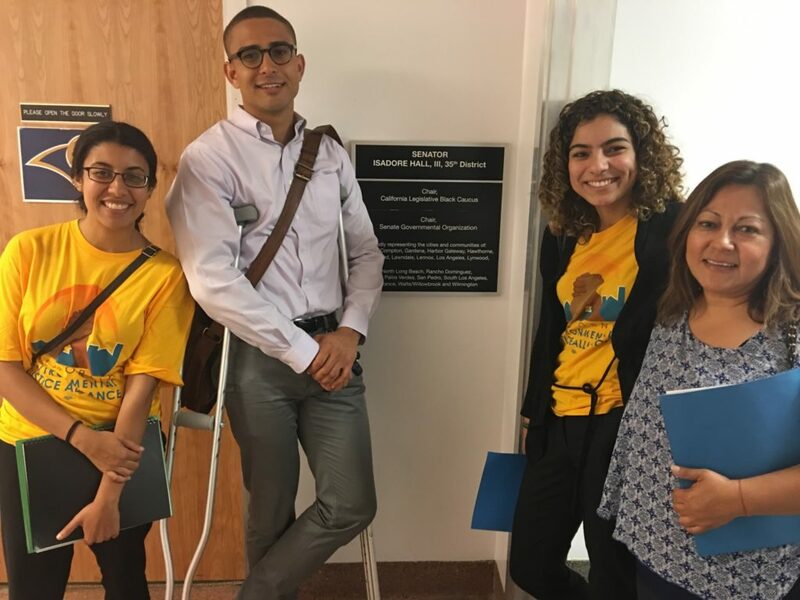 In the final hours of the last day of the California legislative session, lawmakers sent multiple pieces of climate and environmental justice legislation to the Governor’s desk, creating a new center of gravity around communities most impacted by pollution and poverty. These hard fought wins are a direct result of the leadership, power and organized efforts of community members, grassroots leaders, and advocates for climate justice, led by the California Environmental Justice Alliance and the SB 535 Coalition. Today, as Governor Brown signs the last of these bills into law, it is a culminating victory for the grassroots communities that have pushed California to lead the nation in advancing equity through climate policy. Broken down in further detail below, these pieces of legislation: 1) set historic targets to reduce earth-warming greenhouse gases by 2030; 2) bring much needed transparency and accountability to state environmental and climate agencies and the state’s top polluters; and 3) address the need for more comprehensive and equitable investment in community-driven climate resilience strategies, targeted pollution reduction, green infrastructure and good jobs. We can easily look to examples like the Exide battery plant to see that our communities are ignored far too often while polluting corporations are not held accountable for the damage they create in our neighborhoods. For this reason, Gloria Walton, SCOPE’s President & CEO, sees the development of sound climate policy and political power as going hand in hand: “Climate change only exacerbates existing disparities driven by racist policies and land use decisions made without us. A distinctive and powerful community voice━the voice of low-income and working-class communities of color━is needed to bring about climate justice. Only then can we start to shift power away from corporate interests and advance climate policy that brings about environmental, economic and racial justice.” This year’s package of climate bills lays the groundwork for this power shift and signals that climate legislation cannot be passed without the communities most impacted at the table. While there is still much work ahead to ensure that the implementation of climate solutions benefits and prioritizes disproportionately impacted low-income communities of color like South LA, 2016 marks a significant moment for building momentum toward our vision for climate justice━a vision that by 2030, South LA and communities like ours will be healthier, thriving, and more resilient. SB 32 (Pavley) – Greenhouse Gas Emissions Limits: Extends and increases California’s greenhouse gas reduction goals to 40% below 1990 levels by 2030. AB 197 (E. Garcia) – Climate Equity and Transparency Act: Increases public oversight and reduces executive control over the Air Resources Board, the state agency tasked with monitoring, regulating and reducing greenhouse gas emissions. Specifically, the bill directs the Air Resources Board to prioritize local emission reductions for greenhouse gas emitters and enacts new governance reforms at the agency, including setting six­ year terms for board members. AB 1550 (Gomez) – Investments in Disadvantaged Communities: Requires a minimum of 35% of Greenhouse Gas Reduction Fund climate investments to benefit disadvantaged communities and low-income families across the state. AB 2722 (Burke) – Transformative Climate Communities: Creates the Transformative Climate Communities program which funds planning and implementation of community climate plans within disadvantaged communities. These plans will help vulnerable communities reduce greenhouse gas emissions, improve local air and water quality, and create sustainable economic development opportunities.